Powered COM - บ. มาโครแคร์ จก. SUNIX MIO6469PH Multi I/O board, users can expand one RS-232 COM and one IEEE1284 LPT ports to their system, allowing them to use serial and parallel devices further. MIO6469PHL Multi I/O board, users can expand one RS-232 COM and one IEEE1284 LPT ports to their system, allowing them to use serial and parallel devices further. SUNIX DEL2S00PL, PCI Express serial communication board, allows users to add or expand two RS-232 COM ports on PC-based system to use serial devices further. SUNIX DEL4S00P meets the PCI Express Base Specification Revision 2.0. 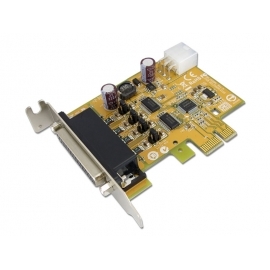 It is compatible with PCI Express x1, x2, x4, x8 and x16 lane Bus allowing it to be installed in any PC-based system structure. SUNIX MIO6469P built-in SUNIX high performance and realizable native PCI Express controller, and as well built with many of SUNIX advanced features and technologies, making it the advanced and high efficient solution for commercial and industrial automation application. SUNIX MIO6469S built-in SUNIX high performance and realizable native PCI Express controller, and as well built with many of SUNIX advanced features and technologies, making it the advanced and high efficient solution for commercial and industrial automation application. SUNIX MIO6479P built-in SUNIX high performance and realizable native PCI Express controller, and as well built with many of SUNIX advanced features and technologies, making it the advanced and high efficient solution for commercial and industrial automation application. SUNIX MIO6479PL built-in SUNIX high performance and realizable native PCI Express controller, and as well built with many of SUNIX advanced features and technologies, making it the advanced and high efficient solution for commercial and industrial automation application. SUNIX MIO6479S built-in SUNIX high performance and realizable native PCI Express controller, and as well built with many of SUNIX advanced features and technologies, making it the advanced and high efficient solution for commercial and industrial automation application. SUNIX MIO6479SL built-in SUNIX high performance and realizable native PCI Express controller, and as well built with many of SUNIX advanced features and technologies, making it the advanced and high efficient solution for commercial and industrial automation application.